There are so many ways to incorporate farm to school into every day classroom activities. We’ve starting compiling a few of our favorites and have included links to sample activities, lesson plans, recipes, tips, or other suggestions where applicable. We haven’t quite made it to 110 ways… Have any suggestions that aren’t on our list? Contact us and let us know! 1. Cook a seasonal recipe as a class and create a “how to” recipe book to take home. 2. Make applesauce in a crockpot…with local apples, of course! 3. Put local spinach and cream cheese in a blender. You just made local edible paint. Spread it on a large cracker or piece of bread. Use bits of carrots, cucumbers, and celery to make a face. Eat it. 4. Visit a farmers market. Go on a hunt for a purple vegetable. Buy the vegetable. Cook it. Eat it. 5. 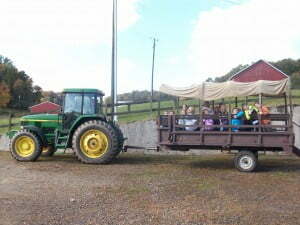 Invite a chef on a farm field trip. Buy stuff from the farm. Ask the chef to cook it for you. 6. Taste two kinds of local apples. Which do you like more? 7. Cut up a local sweet potato into lots of little sticks. Give someone a stick to taste and ask them to guess what vegetable it is. 8. Hold a below-ground-veggie-growing taste test. 9. Share a taste test of a local product with another class. Compare taste preferences. 10. 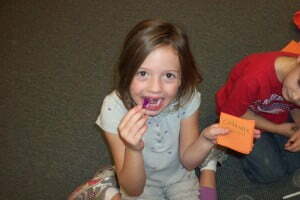 Try radishes 5 ways: whole, sliced, grated, pickled, used as crayons. 11. Look at a local cucumber really closely through a magnifying glass. Then eat the cucumber. 12. Get a chicken. Take care of it. Eat its eggs. 13. Make a list of all of the vegetables you can think of. Use a yellow marker to highlight the ones that grow in your region (or in the summer, or in the fall–you get the idea). Plant the seeds that suit the current season. 15. 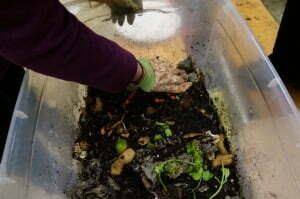 Make a worm bin and feed them scraps from snack. 16. Plant a mystery seed. Can you guess what it will be? 17. Package, market and sell bulk seeds as a fund raiser. 18. Dig up a bit of soil from the garden. Mail it off to get it analyzed. Ask a Cooperative Extension agent to explain the results. 19. Look at a seed catalog to determine which plants can be grown and harvested in the school year. Plant those seeds. 20. Take a nail or other slightly sharp instrument and write your name on a growing pumpkin or winter squash. As the vegetable grows, so does your name! 21. Plant a sunflower house. 22. Do the “Goldilocks Soil Test” to determine if a soil has the proper level of moisture (have three tubs of soil: one that is too dry, one that is too moist, and one that is “just right”) . 23. Grow non-edible plants, like flowers: they are lovely, good for pollination, and can be sold to raise money. 24. Make “Beanie Babies”: Use a small ziploc bag, add a cotton make-up pad, a bean seed, and a few drops of water. Put on a string and have students wear them around their neck. Talk abut how body heat helps with seed germination. 25. Grow a variety of edible flowers. 27. 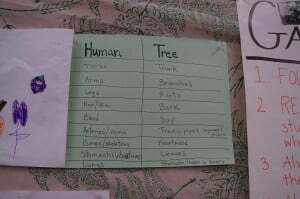 Talk about companion planting to teach about diversity and teamwork. 28. 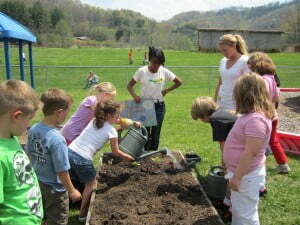 Have a school market garden to sell extra produce. 29. Build gardens out of old pallets. 30. Distribute school garden produce to local organizations to feed the hungry in the community. 31. Have a “Put the Garden to Bed” celebration in Oct. and plant cover crops and garlic. Invite local musicians to play agriculture-themed music. 32. Read “Tops and Bottoms.” Make a list of veggies that grow above ground and then another list for veggies that grow below ground. 34. Make a scarecrow family (mom, dad, baby) for your school garden. Read “Scarecrow” by Cynthia Rylant. 35. Use “Cabbages and Kings” to teach point of view. 36. Read “Food Rules” and discuss it. 37. Weigh raw greens and calculate their volume. Cook them, and remeasure! 38. Chop an onion and count the rings. 39. 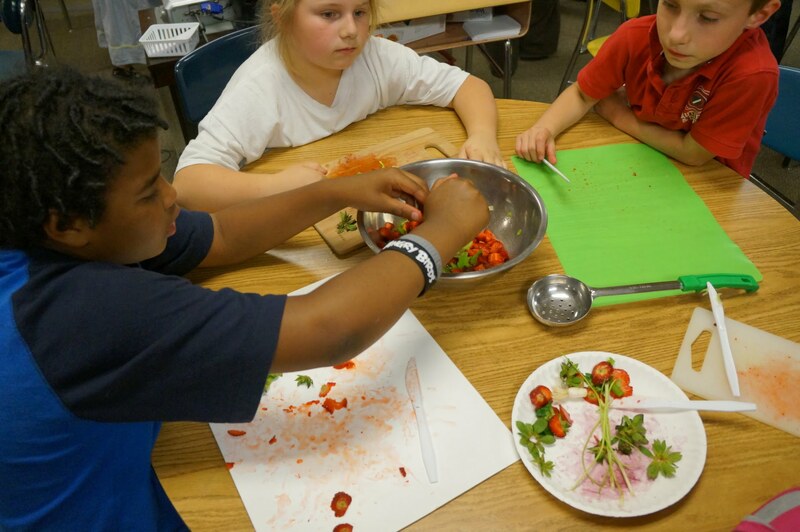 Scale up a recipe to feed the whole school. 40. When you harvest something, weigh it and calculate how much money you could make if you sold it at different stores/markets. 41. Go on a color hunt in the garden. Which colors can you find in the spring? Which ones can you find in the fall? 42. Compare and contrast seeds. Can you sort them by size? by color? 43. Compare and contrast different types of greens. 44. Make a Venn diagram with their similarities and differences. 46. Trace your lunch back to its sources. 47. Interview a family member/grandparent about growing food or cooking. 48. 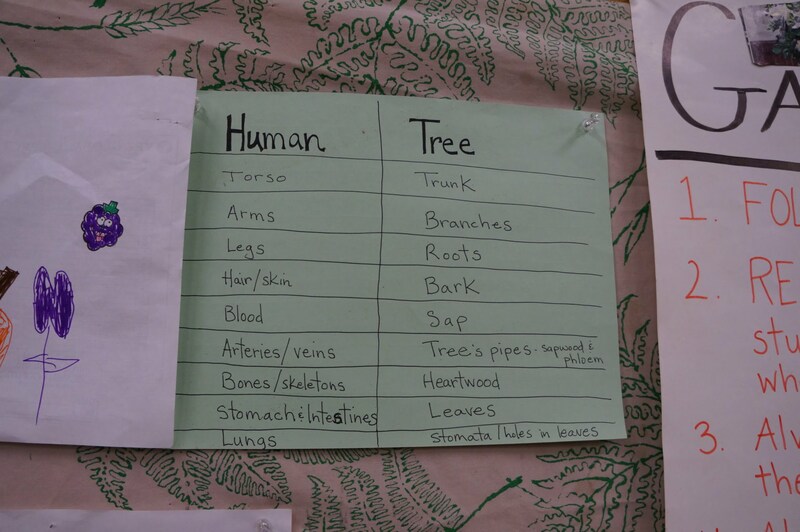 Keep a log of what kinds of plant parts you eat for a day. Did you eat more leaves, roots, or stems? 49. Celebrate a local product every month. Happy cabbage month! How many types of cabbage are there? Have you ever had a stirfry with local cabbage? 50. Create a PowerPoint presentation for your local school board, outlining the benefits of locally grown food and why it should be served in the schools. 51. Make a paper crown. Draw or glue on pictures of vegetables to become a veggie king or queen. 52. Write a garden song and teach it to another class. 53. 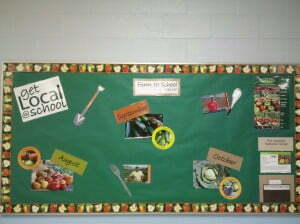 Design a bulletin board about local food and farms. 54. 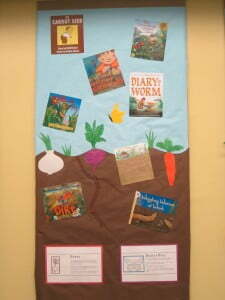 Celebrate National Poetry Month (April) by writing poems about your school garden or local farms. Read them to whole school every day of that month (as part of morning announcements). 55. Create a poem or song about your favorite local food. 56. Make mobiles from recycled silverware, bile tier, and CD’s to decorate your garden. 57. Create promotional materials for local fruits and vegetables served in the cafeteria. 58. Make up a menu for a restaurant that sells local food. 59. Make up a week’s menu for your school’s cafeteria, highlighting the locally grown products. 60. Visit a farm and pick blueberries. 61. Visit a farm and pet a goat. 62. Visit a farm and learn about bees. 63. Invite a farmer to come talk to your class. 64. Interview a local farmer. Ask about his or her business, favorite vegetables, favorite aspect of farming, etc. 65. Visit a farm and help with a farm chore. 66. Visit a beehive and make lip balm from local honey and beeswax. 67. Ask a local cheesemaker to demonstrate cheesemaking. 68. Ask a local farmer to bring in a sheep or other fiber animal and/or demonstrate spinning/dyeing/knitting. Learn to knit with local wool. 69. Use Google to find a farm near you. Write to them and ask a question about their farm.